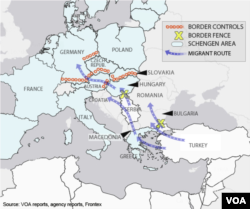 As the flow of Syrians, Afghans and others through the Balkans toward Western Europe continued unabated Sunday, European leaders meeting in Brussels may agree to send 400 border guards and set up new checkpoints if the EU's frontier states drop their policy of giving arrivals passage to other countries, according to a draft statement. "We commit to immediately increase our efforts to manage our borders," according to a draft statement seen by Reuters that must still be agreed upon. Also to be discussed, according to the draft: deploying more ships off Greece and agreeing not to send migrants from one country to another without prior agreement. The mini gathering of central and eastern European leaders was sought by German Chancellor Angela Merkel, who has voiced concern for migrants as winter sets in. A youth walks toward Serbia's border with Croatia, in Berkasovo, Serbia, Oct. 25, 2015. Thousands of migrants and refugees are still crossing from Serbia into Croatia and continuing their journey towards Western Europe. Sunday's meeting is the latest in a series of top-level EU meetings that have, so far, failed to find a unified approach on how to deal with the thousands of migrants streaming into the EU every day. 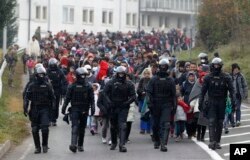 On Sunday, Croatia Interior Ministry spokesman Domagoj Dzigulovic said a record 11,500 migrants entered the country Saturday -- the most in a single day since migrants began entering the country in mid-September. Police said the country has seen nearly 250,000 enter the country since then. Migrants turned to Croatia after Hungary erected a barbed-wire fence along its border with Serbia earlier this month. European Commission President Jean-Claude Juncker called leaders of Austria, Bulgaria, Croatia, Macedonia, Germany, Greece, Hungary, Romania, Serbia and Slovenia, plus refugee organizations involved, to attend the meeting in Brussels. "Every day counts," Juncker said Sunday in an interview in German weekly newspaper Bild am Sonntag. "Otherwise we will soon see families in cold rivers in the Balkans perish miserably." Some EU lawmakers have complained that all states should be there for the meeting at 1500 GMT in Brussels and that France's absence in particular could limit progress on a plan. "The challenge now is to slow down the flow of migration and to bring our external borders under control," Juncker told Bild. "We must also make it clear that people who arrive at our borders who are not looking for international protection have no right to enter the EU." However, the draft plan has drawn criticism for its proposal that countries stop allowing asylum-seekers to pass across their borders without consulting with their neighbors. Bulgaria, Serbia and Romania said they would close their borders if Germany or other countries shut the door on refugees. Croatian Prime Minister Zoran Milanovic said Saturday that such consultation "is impossible." Serbian Prime Minister Aleksandar Vucic said Sunday he was prepared for "hard, not very pleasant" talks, but hoped leaders could work out a "comprehensive solution." Vucicsaid Serbia would not "put up any walls" but suggested his country will not agree to be the only migrant stop if countries farther west close their borders. At the Brezice camp in Slovenia near the border with Croatia, U.N. refugee agency (UNHCR) spokesman Babar Baloch urged leaders to come up with a system to register and screen newcomers when they first enter Europe, rather than piecemeal along the way. 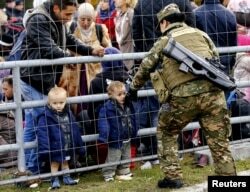 A member of the Slovenian army talks to migrants waiting at the Austrian border near the village of Sentilj, Slovenia, Oct. 25, 2015. The lack of a common policy is straining ties between European leaders, raising questions about the EU's future. Rights group Amnesty International said the 28-country bloc could not afford to end another meeting without an agreed plan. "As winter looms, the sight of thousands of refugees sleeping rough as they make their way through Europe represents a damning indictment of the European Union's failure to offer a coordinated response to the refugee crisis," said John Dalhuisen, Amnesty's director for Europe and Central Asia. The continent is experiencing the worst migration crisis since World War Two. At least three migrants -- two children and a woman -- drowned on Sunday when their boat sank off the Greek island of Lesbos, the coastguard said, the latest fatalities in Europe's refugee crisis which has claimed nearly 3,000 lives. Syrian refugees lie exhausted moments after arriving by a raft at a beach on the Greek island of Lesbos, Oct. 25, 2015. Around a dozen others, mostly Afghans, are still missing after the rickety vessel, carrying 60 people, went down at dawn as it made the perilous crossing from Turkey, according to the Greek coast guard. Also Sunday, the bodies of 29 people thought to be migrants were discovered on beaches near a city 160 kilometers (100 miles) east of Tripoli, the Red Crescent said. "Local residents told us about bodies on the beaches around Zliten," spokesman Mohamed al-Misrati told the French news agency AFP. "We discovered 25 bodies, then another four." Misrati did not give any further details about the nationality of the deceased, but the Tripoli authorities' official news agency reported that they were from Africa.